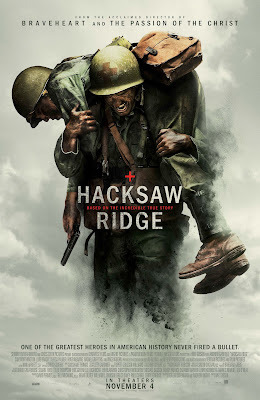 About a month ago, when I first heard about Mel Gibson's return to directing, a WWII film called Hacksaw Ridge, a critic on a podcast I listen to had seen it at a film festival and felt put-off by the fact that a movie about a non-violent protester should be so violent. Then, a thought occurred to me...wars don't stop being violent for the people who fight them. Mostly praised, this seems to be one of only two arguments that can possibly be made against this movie, one of the most well-made (and certainly violent) war movies I've seen. Hacksaw Ridge was the nickname given to a plateau held by Japanese troops during the Battle of Okinawa. The film itself spends only about a third of its time there, spending most of its time bringing us close to its hero, Desmond T. Doss. Desmond Doss (Andrew Garfield) is a real guy, the first conscientious objector to win the Medal of Honor. A poor Southern boy from the mountains of Virginia, violence seems tied to everything that he is. As a boy, he fights with his older brother and a near tragic act of violence sends him firmly into the embrace of Christianity and solidifies his belief in the Sixth Commandment. His mother (Rachel Griffiths) is strong in her faith, loving and gracious. His father (Hugo Weaving) is a hard-drinking, violent alcoholic haunted by the horrors and losses he experiences in World War I. A war is the last place he would want to find his two sons. Alas, the call for the young American men comes again, just as Desmond is coming of age. Despite his poor education, Desmond has a knack for caring for the sick and wounded and, after providing first aid to an injured friend, finds himself a match in Dorothy Schutte (Teresa Palmer), a young nurse at the local hospital. She reluctantly agrees to a date with the skinny young mill worker and a love story emerges. The war keeps growing, keeps calling. All the young men of his town enlisting to fight, to do their duty. Desmond wants to do his part, despite his personal vow to not bear arms, even during war. Perhaps he can be a combat medic. Instead he is sent to a rifle company under the charge of the sarcastic, but hard, Sergeant Howell (Vince Vaughn) and Captain Glover (Sam Worthington), a leader who expects his men to fall in line. Like his superior officers, his brothers-in-arms, including Smitty (Luke Bracey), can't seem to grasp his unwillingness to fight as they do. The Army is not easy for Desmond, providing nearly impossible hoops for him to jump through, until the war finally calls him for that which he was meant. What Hacksaw Ridge does best is to let us truly feel every perspective surrounding Desmond's beliefs. We understand his choice from his life experiences as well as his adherence to his religion. Gibson does a wonderful job, first and foremost, in directing the performances. Rachel Griffiths and Hugo Weaving both bring a lot of power to the table as Doss' troubled mother and father. Weaving is especially good, putting together a performances that is equal parts menacing and empathetic, driving the early parts of the film. The chemistry between Andrew Garfield and Teresa Palmer is also a driving force in the film's mid-section. Garfield plays the relationship with half smiles and nervous chuckles, a man knowing he has a woman out of his league. She is that woman but Palmer brings a sense of understanding in every scene. I couldn't help but smile every time they were on screen together. And there is plenty of smiling to be done here. The obligatory boot camp scenes are elevated to new heights by Vince Vaughn. What a treat he is in this role, given just the right amount of room by Gibson for comic relief, while still maintaining his respect as a soldier. Which brings us to the masterful, shockingly violent, final act, perhaps the most brutally truthful portrait of war violence ever brought to the screen. Mel Gibson, as a director, is no stranger to bringing the blood and gore to the forefront of the historical events he has recreated. He did it in the Oscar-winning Braveheart. He did it again with his story of the last hours of Jesus in The Passion of the Christ. Here he gives us the Pacific side of World War II in living color: blood, sweat, tears, dirt, arms, limbs, lives, all for the taking just as they surely were on that battlefield, now over 70 years ago. There are some shots in this film so graphic even I had to close my eyes. There are some shots in this film the likes of which I've never seen...and was in total awe of. But for all its technical perfection, it is not a totally perfect film. There are some shots toward the end that go a bit too far but not the ones you'd think. There are two in particular that just bothered me a bit. Hero worship type stuff, painting the hero as Jesus- or God-like. Even so, the epic final battles feature the work of the kind of hero in Private Desmond T. Doss that certainly hasn't come along very often in the history of this world in which we live. Our world is a violent place and that should not be sugarcoated. I applaud Hacksaw Ridge for respecting that enough to truly show it. In fact, I can't think of a better way to praise a non-violent hero than by showing us the violence he endured in the face of his convictions. And his willingness to stare it down, unarmed, and save peoples' lives anyway. And I can only hope that we can learn from the violence that surrounds us, just as it surrounded Private Doss, that even more violence may not be the answer, that heroes don't have to carry weapons. They need only have the resolve to care for others more than themselves. The reviews of this film are swaying me. I wrote it off when I saw the trailers. Great review! I thought this was amazing. One of the year's best films so far. (P.S. I loved every scene that had Rachel Griffiths in it. This is her best performance since Six Feet Under). But the film was just so... amazing. It's one of the best war films in recent memory. And it definitely shows that war is an awful thing. It's a solid movie. No doubt. I so want to see this film as I love War films for the most part. Today is Remembrance Day and I think of my dad who fought and was wounded and my mom, who was German and just a teenager when she went through the bombings of Hamburg and Dresden. War is not pretty..it's downright disgusting especially what my mom saw-burnt bodies, bloated bodies in the river, dismembered bodies. It's war and this is what goes on. This movie pulls no punches. It goes all the way there and I love that about it. Great review Kevin! I've always been a big fan of Mel Gibson, the director, even if I haven't exactly loved most of the films he has made. And I've been pretty excited of this one for a long time. Can't wait to see it. Between this and Scorsese's Silence Andrew Garfield is having one heck of a year.